This website reviews the early history of Euro-America settlement and development of the Jacoby Creek area in Humboldt County, California. It is intended to give the viewer some idea of the changes that took place in this area in the late nineteenth and early twentieth centuries. Nearly all of the information in this article came from Susie Van Kirk, and her report on the area for the Humboldt Bay Watershed Advisory Committee’s Salmon and Steelhead Conservation Plan. Jacoby Creek is one of four major tributaries of Humboldt Bay on the North Coast of California. While the paths of the other tributaries of the bay have been altered, the course of Jacoby Creek has been left much as it was at the time of European settlement. The creek drains a watershed of 17.3 square miles. The Jacoby Creek watershed is a part of the ancestral territory of the Wiyot native people. Historically the creek has been an important spawning habitat for salmon, steelhead, and even coastal cutthroat trout. The creek remains habitat for Coho salmon and other salmonids coming home to spawn. Fig. 1 Marshland Looking Toward Bayside. From the library of Howard Melendy. The lower or bottom lands of the Jacoby Creek watershed are pictured above in Figure 1. This lower portion of the watershed was used for agriculture. There were dairies, farmlands, and ranches. Where there was once a lively farming economy there are now small house gardens, some horses, and a few cows and sheep. Some of these lands were reclaimed from the sea through a process of diking. This work created more farm and pasture land, and changed the landscape and the ecology of the area. The Costal Survey map found below shows the system of sloughs and drainage channels which existed before the diking. (click here to see the maps). Likewise the 1865 Doolittle Map shows where the swaths of marshlands previously existed around the bay before being reclaimed for agriculture. 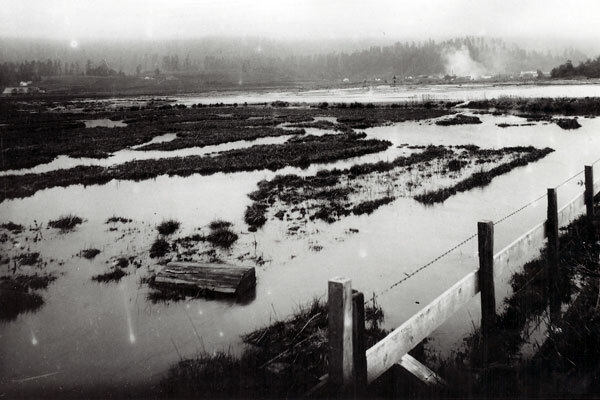 It has been estimated that the size of the bay may have been reduced by as much as 10,000 acres since the beginning of reclamation activities in the early 1890s. While dyking changed the appearance, ecosystem, and accessibility of the bays marshlands and estuaries, logging altered the landscape of the surrounding hills and valleys. Logging has long been a livelihood for the people of Humboldt County. Jacoby Creek has been logged a number of times in the past 150 years, and likely will be logged again. However trees such as those pictured in Figure 2 are probably non-existent in the watershed today. Flanigan, Brosnan & Co., a logging company, built a railroad in 1882 for the transportation of the huge trees estimated that they would bring 8,000,000 board feet of lumber down over the course of a year. In neighboring Rocky and Washington Gulches, both tributaries of Jacoby Creek, similar railroads had already been in use since their construction in 1875 by John Dolbeer and William Carson. By 1877, their two seasons of work had made 6,000,000 board feet ready for the mill. The community that developed near to Jacoby Creek and the logging industry there was named Bayside in 1876. The growth and prosperity of this town was linked to how much resource removal was being done in the watershed. Members of Dolbeer and Carson's work force settled here and helped found the community. When the logging of the creek's trees halted for a while in the 1890's ,quarrying became the new business of interest. It was noted by the Arcata Union that "times will be pretty lively about Bayside the coming summer" when the quarrying work was set to begin.